For the first sixteen months of her life, my daughter Jayda, who at ten is already two inches taller than me, stayed with my mother or her father during the day while I worked. As she grew older, I knew that despite my discomfort with using childcare, she needed to be around other children, and she needed to be in an environment where she could learn and develop. Working in child development services at ChildSavers for the past seven years has given me perspective on what quality childcare looks like, and I realize, after the fact, that I did a lot of things correctly when deciding on childcare for my daughter years ago. To choose the right childcare, Jayda’s dad and I interviewed childcare facilities. This list of questions should help you, too. 1. Is your program licensed or registered? When looking for a childcare provider, I did a lot of online research. I went to the Virginia Department of Social Services (DSS) website and found a list of qualified childcare providers in our area. There, I was able to review the provider’s DSS inspection summaries to see any violations, or if there were any other major issues. You want to make sure that the childcare has been in business for several years, and that they are licensed or registered with the local government. Having a license or being registered means government agencies will make unannounced visits throughout the year to inspect the childcare center or in-home childcare provider to ensure compliance with state guidelines and regulations. 2. Is the childcare facility safe? fire extinguishers and first aid kits in each classroom. 3. What is the staff-to-child ratio? The number of children and teachers was a major concern for me. I didn’t want my child in a classroom with too many children and not enough teachers. Smaller groups allow for the children to have more one-on-one with the teacher, and to interact with other kids. The childcare center that I chose had no more than twelve to fifteen children per classroom with two adults, a teacher, and an assistant. This was ideal because there was more than enough supervision, and the children who needed individual time with adults were able to get it. What is the ideal ratio for childcare? According to daycare.com (where you can click on Virginia to find specific information), it’s one adult for every five children two to three years old; one provider for every seven children three to four years old; and one provider for every fifteen 5-year-olds. The older the kids are, the higher the allowable number of children is per adult childcare provider. Having a classroom filled with too many children can be challenging and overwhelming for the provider or teacher. If the adult is overwhelmed, then the children will be, too. 4. What will my child learn? Is there a curriculum in place? As my daughter moved into her preschool years, I wanted to be sure she wasn’t sitting for extended periods of time, being drilled on the usual ABCs and 123s. Yes, those things are important, but there is so much more children need to learn before they enter kindergarten. I asked if the program was using a curriculum or guidelines that helped teach the children. The curriculum is the teacher’s guide to help her focus on all areas of the child’s development. Day-to-day operations and learning should support children’s social, emotional, and intellectual development. An evidence-based curriculum will include cognitive, social and emotional, physical, cultural, and language and literacy components. I also wanted to know if the children had free play, and if they were allowed to explore. All of these components are indicators of a high-quality childcare program. 5. How do you communicate with parents? Having open communication with my childcare provider was important to me. At my daughter’s childcare, there was always an open-door policy. I could talk with my child’s teacher during, before, or after school, and ask questions about Jayda’s progress and address any issues she or her teachers might have had. My daughter’s teacher had a parent bulletin board updated monthly. The board had a lot of helpful information such as the theme for the week or month, the menu for each week, reminders about field trips, and information about picture day. Bulletin boards are also beneficial because they often answer questions you might have before you even need to ask them. This is an excellent way for a teacher to interact with parents. These days, many childcare facilities have email and text-alert systems in place to communicate regularly with parents. Anything that helps families stay connected with their chosen childcare provider is a good thing. Finding a good childcare center or home-care situation for your child can be challenging and frightening, exciting and wonderful – all at the same time. You want to make sure your child is receiving high quality care, and is in a loving, safe, and nurturing environment where he or she will gain the skills and knowledge to help be prepared for kindergarten. Children enrolled in quality childcare gain a strong foundation that sets them on a path for health, happiness, and success. Research has shown that children who attend high quality childcare programs have better social, language, math, and reading skills when they enter school. Because I work in the childcare field, I see the importance of quality childcare every day. Quality childcare regulations are designed to help childcare directors, teachers, and providers enhance education, qualifications, curriculum, assessment, environment, interactions, and health and safety for your child so your family can have a positive childcare experience and your child can thrive. 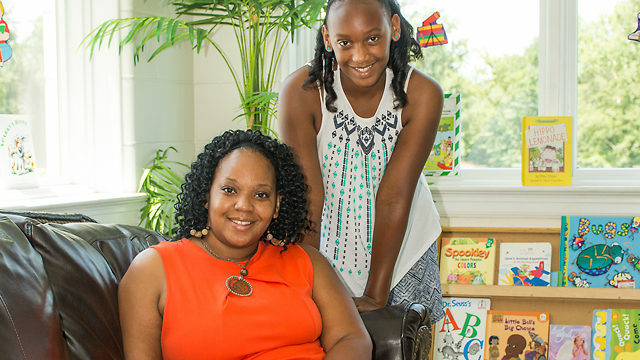 Real Mom LaTasha Smith works at ChildSavers as the child development service program coordinator and lives with her 10-year-old daughter Jayda and their pet fish. For more information about childcare or a childcare referral program, you can visit Child Savers.